During excavation work carried out below the visitors’ pathway in the northern part of the west Aswan cemetery, at Qubbet Al-Hawa site, archaeologists from the University of Birmingham and the Egypt Exploration Society (EES) Qubbet Al-Hawa Research Project (QHRP), stumbled upon what is believed to be an ancient Egyptian encroachment wall. Head of the Ancient Egyptian Antiquities Department at the Ministry of Antiquities Mahmoud Afify told Ahram Online that the wall is two-metres high and is part of the architectural support of the known tombs of the first upper terrace, including those of Harkhuf and Heqaib who were governors of Elephantine Island during the Old Kingdom. Given the landscape of Qubbet Al-Hawa, he explained, the support wall helped to secure the hillside and thus lower lying tombs that were accessible by a causeway leading to a second terrace. 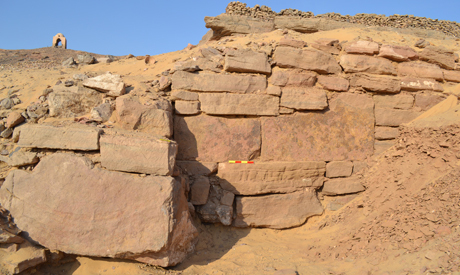 Nasr Salama, general director of Aswan and Nubia Antiquities, described the discovery as “stunning,” adding that it is now only a matter of time until new tombs are uncovered within the important cemetery. Eman Khalifa, director of the pottery project within QHRP, said that early studies on the discovered pottery shreds embedded within the mortar used to build the wall show the exact dating of the wall. The studies, she continued, reveal that the crushed pieces include parts of carinated bowls executed in style typical of the reign of King Pepi II from the Sixth Dynasty (c 2278-2184 BC), together with pieces of Marl Clay jars typical of the First Intermediate Period and the Middle Kingdom. “Thus indicating the expansion of the cemetery during the latter part of both periods,” Khalifa pointed out. 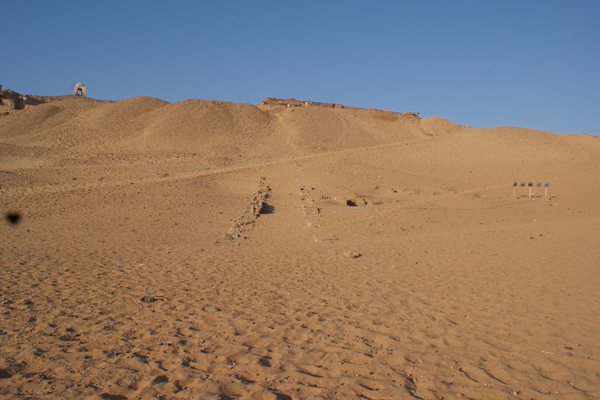 Mission director Martin Bommas of the University of Birmingham said that the find was part of the project's successful first field season, which included the recent discovery of the long sought causeway of Sarenput I, first governor of the area at the beginning of the Middle Kingdom.